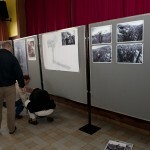 The Salle des Fetes is decorated with wartime aerials, images and panoramas. 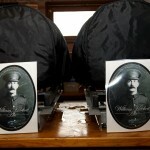 Two barrels of the specially brewed ‘William Hackett Ale’ await the guests. 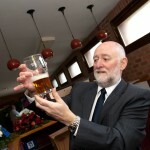 The ‘William Hackett Ale’ brewed specially by Barngates Brewery is checked. 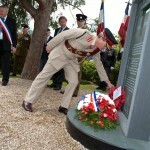 Peter Barton dismantles the protective box around the memorial. 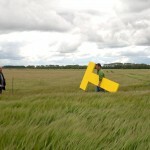 The large-scale yellow ‘T’ to mark the site of the Shaftesbury Shaft is put together. 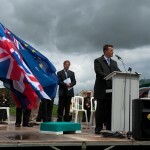 …and carried into place by Jeremy Banning. 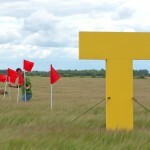 The yellow ‘T’ is fixed in place. 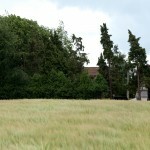 A line of red flags marks out the destroyed gallery in which William Hackett and Thomas Collins still lie. 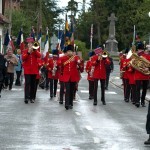 Nottingham Band of the Royal Engineers begins their repertoire and tour of the village. 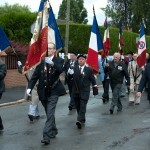 French standard bearers join the march around the village. 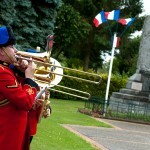 The band plays at the village war memorial which commemorates villagers lost in both world wars. 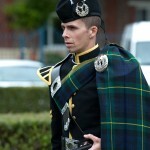 Pierre Dervaux, the piper from The Ypres Surrey Pipes and Drums joins in the parade. 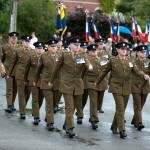 An Honour Guard provided by 170 (Infrastructure Support) Engineer Group lead the march to the Salle des Sports. 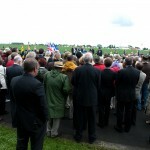 Crowds of attendees walk past the memorial to the Salle des Sports for the start of the ceremony. M. Jacques Herbaut, Maire de Givenchy with Givenchy resident, Mme. 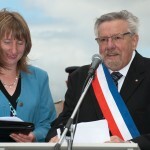 Tracy Bernard who provided translation. 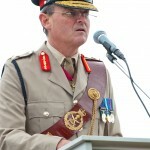 An address was made by Lieutenant General David Bill (late Royal Engineers). 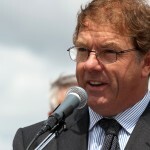 A few words from Peter Barton. Jeremy Banning reads from the diary of Sapper John French, 254TC. 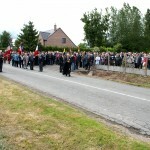 The ceremony was very well attended. 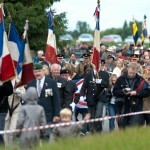 Following the speeches the crowds moved down to the roadside opposite the field where Hackett and Collins still lie. 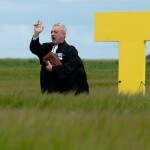 Reverend Pat Aldred at the site of the Shaftesbury Shaft. 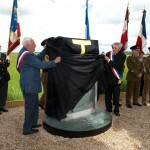 The memorial, as yet unveiled, can be made out in the background. 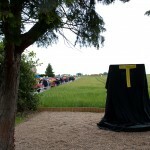 The attendees move down to the Tunnellers Memorial. 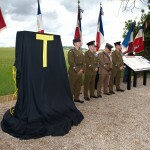 The memorial, draped in black with a yellow ‘T’ is flanked by the Honour Guard and French standard bearers. 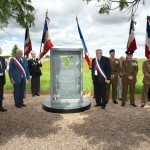 M. Jacques Herbaut and M. René Cuvelier prepare to unveil the memorial. 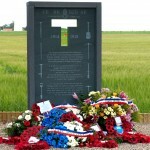 The memorial is unveiled to the public. 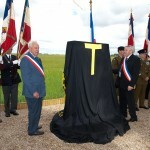 Piper Pierre Dervaux at the site of the Shaftesbury Shaft. 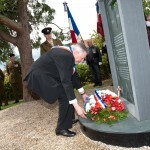 Wreath laid by M. Jacques Herbaut on behalf of the village of Givenchy. 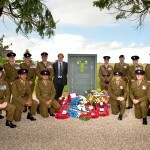 Wreath laid by Lieutenant General David Bill (late Royal Engineers). 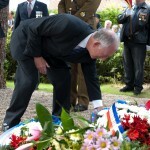 Wreath laid by Canadian officials. 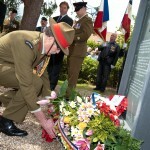 Wreath laid by the Defence Attaché of New Zealand. 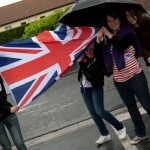 The national anthems of France, Great Britain, New Zealand, Canada and Australia were then played. 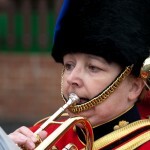 A member of the Honour Guard. 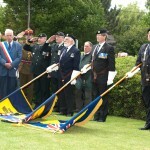 Geoff Hackett – great nephew of William Hackett VC lays his wreath. 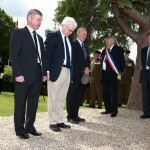 John Abraham, Terry Carroll & John Carroll – nephews of Thomas Collins lay their wreath. Attendees came from all ages. 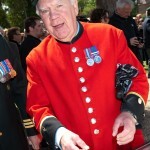 David Poultney, a Chelsea Pensioner pays his respects. 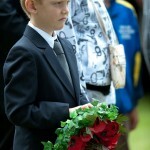 His uncle, David Hughes, was a tunneller and was killed in October 1915. 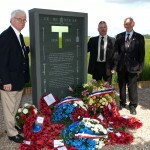 John Abraham, Terry Carroll & John Carroll with the Tunnellers Memorial. 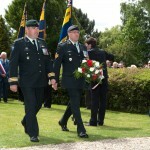 Peter Barton joins the Honour Guard from 170 (Infrastructure Support) Engineer Group at the memorial. 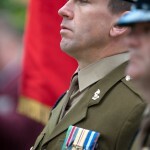 Geoff Hackett with a detachment from Hackett Troop. 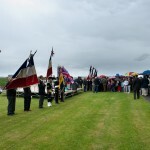 The Tunnellers Memorial resplendent with wreaths after the unveiling ceremony.